This book is about all things big. That's fitting because my love for this book is big, too. It's about a sixteen-year-old, Ellie Morgan who loves to grow. She sets a goal for herself to lose 20 pounds and attract the attention of Wes, a new boy in town and win the Rock River Pumpkin Weigh-In by growing a 600 pound squash that qualifies as a pumpkin. Even when the world throws pumpkin thieves, sweet corn coquette contestants that are eying Wes, and a very mean Cyril Pool and his huge pumpkin, Ellie remains always seeing the funny side in things. This book made me laugh and feel sick with worry. But it also made me want to grow my own huge pumpkin! It's an amazing book that everyone should read. It's full of suspense, humor, and other huge things. Dragon Slippers by Jessica Day George is one of the best books I have ever read. It is about a young girl named Creel. Her only dream in life is to move to the King's Seat and open an dress shop, to complete her mother's life goal. But her aunt wants her to marry into money so their family will be rich. She goes on adventures and makes her way up in the city, and into trouble! Since I love dragons and such, I really enjoyed this book. It was funny, in the sense that you see a totally different view of dragons, not the usual fire-breathing, knight-eating ones. I think that this book will appeal mostly to girls, since it has some love, princesses and such. I really recommend this book if you enjoy fairy tales, and modern twists on them. Dragon Slippers is an amazing book and if you like this one, you should definitely read the sequel, Dragon Flight. 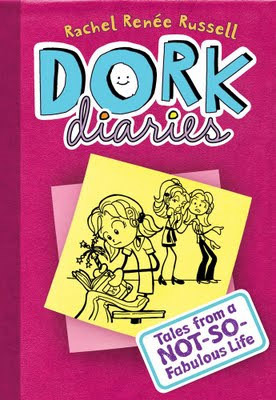 Dork Diaries is a really good book for young girls who enjoyed Diary of a Wimpy Kid, and want something for themselves. This book is about a girl named Nikki, who moves to a super expensive private school, on her dad's exterminating scholarship that he got for her. She hates it there, because everyone has cellphones, designer clothes, and money, things that she doesn't have, and needs, to fit in. But, she makes two unexpected friends who help her rule the school. I sort of like this book. It wasn't the usual adventures that I enjoy, bu I guess it was okay. It wasn't very exciting and I could predict mostly everything that happened. This book will NOT, I repeat NOT, appeal to boys. This book was solely meant for girl eyes only, and that is how the world stays in balance. The age range for this book is about 6 (with parent help)-11. Anyone older won't really like this book. If you really enjoy Dork Diaries, you should read the next two books that come after it, because they are equally as funny and girly as the first. Many girls can totally relate to this, that is what makes it such a fantastic book. The Swiss Family Robinson is an amazing classic that I really enjoyed for its difficult language and great style. This book is about a Swiss family that gets stranded on a remote, undiscovered island. They use their great skills to overcome the challenges presented to them when they arrive on the island. I just adore this book. I mean, you can't criticize a classic, they were named "classics" for a reason. I love how this books sets a great mood. Whenever they discover something on the island that makes their lives easier, you get this sense of accomplishment as well. This book is also very good because if you are young, you learn new things that you would never have bothered to learn beforehand. And if you are an older person, well, you still learn stuff. This book isn't for those that just need to read a book for school and get it over with. This book takes time, a high level of reading, and a passion for books, to get the complete feel of it. 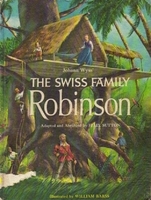 The Swiss Family Robinson is a classic that does not know of such thing we call "time" because everyone, no matter how young (at least 10 years old) or old, boy or girl, will enjoy this book. What do you think of a poem? There's so much you can do with a poem—it's expressing your whole feeling about something. It can be about sadness, madness, happiness, love, anything. Love That Dog by Sharon Creech is a story made of several poems about a boy named Jack who first doesn't get what a poem really is, but later learns to express his feelings about his dog, Sky. At first, Jack thinks that poetry is only for girls, and when he tries, he can't do it. Because he doesn't understand it. He keeps on writing his thoughts about poems on a piece of paper, without even noticing that what he wrote is a bunch of poems. His teacher encourages him, and his poems are put up on a wall. Jack keeps on writing more and more, and he also reads many poems written by other poets which inspired him so much. He actually has a great sadness that still stayed in his heart: his dog, Sky, died in a car accident. How is Jack going to get that feeling out and think of it in a new way? What I love about this book is that in every word, in each line, I can feel what Jack must've been thinking. A lot of emotions is put into the poem, and I never knew that poetry can be as interesting as this. It teaches you how to read and write and understand a poem. Like how other poets inspired Jack, this book of poetry inspired me to write a few poems too. To read this book completely, you need some patience when you notice that it is a bunch a poems. But when you start reading, you'll never think so. The moment I read the first poem, I thought that I maybe agree with Jack. But as I read on, I learned that poetry can be very fun and interesting. You should try reading it too—and write your own about your own emotional thing that you wish to express. The Wonderful Story of Henry Sugar and Six More Stories had so many wonderful stories in it, just like its title. This book is for girls and boys grade 3 through 7, although some younger or older people may enjoy it as well. For example, I'm going to talk about The Wonderful Story of Henry Sugar. The Wonderful Story of Henry Sugar is about a wealthy, selfish, lazy, and gambling man named Henry Sugar who's mind and life completely changed after reading a book about an Indian yogi being able to do amazing magic things such as seeing through objects when he kept on working on yoga. So after he read the story, he started to work on the yoga exercise the book mentioned, so that he can see through the cards when he's gambling, and he would win a lot of money. But because he worked on yoga so much, his mind got way more disciplined than before. He started to think in a different way, and he decided to use all the money he got from gambling to help orphans who really need to be saved. And he did. There are six more stories as wonderful as the one I talked about above, and they're all very imaginative, unexpected, interesting, and usually magical. As you're reading, you'll be able to just imagine all the setting, the character, how the characters talk and act like, and what the characters felt like in the book. You'll become the character, and do what the character's doing and feel what character's feeling, in your head. It will feel like getting into the story, standing on the setting from the book, and exploring everywhere. You'll never get bored. One little thing that you might not like about this book is that the plot twists around a lot and the ending is usually very unexpected. But still, it might be a thing that makes the story more fun and interesting for some people. Other than that, they were all very amazing, wonderful seven stories, and you should definitely read this book, The Wonderful Story of Henry Sugar and Six More Stories by Roald Dahl. Looking for something different? You've reading the right book review! The Difference Between You and Me is about two teenage girls, Jesse and Emily, who couldn't be anymore different but they share a romance that doesn't extend beyond the the local library's bathroom. Their secret love hits a bump in the road (more like a boulder, actually) when they disagree on a heated issue. The Difference Between You and Me is not your typical YA romance. The story is actually more about the compromises we must make in order to get justice then a simple teenage fling. The characters are very unique and compelling. The plot is definitely something new and is crafted excellently. Another interesting thing about this book was the alternating viewpoints. It's fun to get into more than one character's head. The downside to this book is the pace. It gets a little slow, but it's still worth it. So seriously, read this book. It will get you thinking. Don't drink and drive kids. In case infomercials and health class has not engraved this message in your mind already, read this book. In Head Case, a teenage boy, Frank, is paralyzed from the waist down after crashing his car because he drank too much. Frank must now come to terms with his new lifestyle as well as the death of his girlfriend, who was killed in the same crash. This is not your typical angst, but it is your typical message. But even an exhausted lesson in literature can be brought to life with a good plot and interesting characters. The characters were mediocre, but the story itself was quite enjoyable. It's a short novel that keeps you hooked until the end. And oh, the end was impressive! I would suggest this book to any young adult. Just don't read it and drive. Seriously. Have you ever completely changed your personality? In the book Happyface by Stephen Emond, the main character, whose real name remains unknown throughout the whole book, moves and changes into a completely different person. He creates a new personality as Happyface, the nickname he earns at his new school. He becomes a new, popular and smiley person, the exact opposite of the nerd he was before. Since the book is his journal, you can see exactly what he's thinking. He also draws pictures to go along with the story, which is really interesting. The characters in this book seem very real, making you want the best to happen for them while the book completely surprises you with twists you did not expect. This book also creates a certain attachment for the characters which makes it very upsetting when something bad happens to them. The setting of the story and how he gets to where he is a bit questionable, though. All in all, it was a really great book, that is funny and sad at the same time. Sleepaway Girls by Jen Calonita is a really predictable book. Sam goes to summer camp for the first time to be a Counselor In Training and it isn't exactly what she was expecting. She went to summer camp because she needed some change, and her best friend got a boyfriend, making Sam the third wheel. Her summer is not uneventful because she get stuck with the queen bee of the camp, Ashley, who feels threatened by Sam so she feels it's necessary to try to make her summer and bad as possible. Sam also has some boy troubles, in the typical love triangle form. Almost everything in this book was predictable, making it very boring at some points. Even though you could tell what was going to happen before it did, but it was still a fun book to read. The characters were a little unrealistic and monotone and there was minimal character development throughout the story. This book was a fun and quick read, but was sometimes boring and not very exciting.